Tri-C President Alex Johnson (left) and Cleveland State President Harlan Sands shake hands after signing the Degree Link agreement Thursday morning. 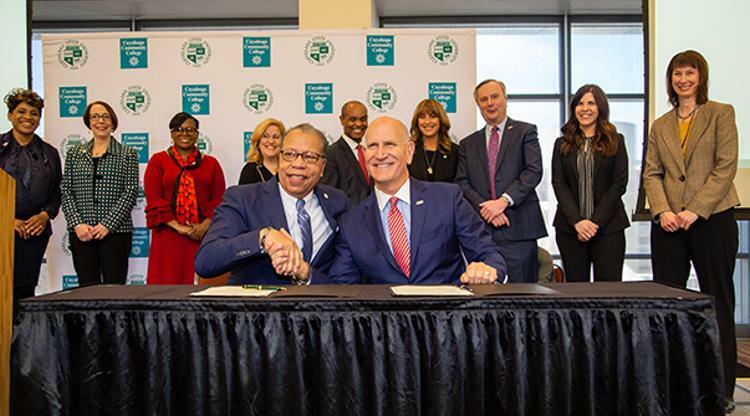 Cleveland State University and Cuyahoga Community College (Tri-C®) have launched a new initiative that builds on efforts to nurture a college-going culture, broaden access to higher education and increase degree attainment. The Degree Link program will provide students with structured academic pathways to four-year degrees while allowing students to move seamlessly between the two largest higher education institutions in Cleveland. The goal is to improve college access and academic success — a critical component in elevating the region’s workforce and increasing economic opportunity. The program will also boost the efforts of Cleveland’s recently announced Say Yes to Education initiative, which works to put a college degree within reach of urban high school graduates. Degree Link was announced at a Feb. 28 event featuring Tri-C President Alex Johnson and CSU President Harlan M. Sands. It included a signing ceremony for an enhanced partnership agreement between the institutions. Degree Link will chart degree maps showing students the route from an associate degree at Tri-C to a bachelor’s degree at CSU. The program includes access to CSU courses, advising services and facilities to assist individuals in meeting that goal. Carefully designed strategies will meet the needs of specific student populations. The expanded partnership builds on the already strong relationship between the two institutions, which saw more than 5,600 Tri-C students transfer to CSU between 2015 and 2017 alone. Degree Link will establish clear guidelines for what students must do at Tri-C to qualify for full admission to CSU. It will also leverage the existing cross-registration program to allow Tri-C students to take one course per term at CSU for the second, third and fourth semesters of their associate degree program. In addition, advising and success coaching will support students from the beginning of their studies at Tri-C through graduation from CSU. Finally, Tri-C students in the program will have access to facilities and services at CSU, including the library, computer labs and recreation center — an arrangement designed to make them feel part of both institutions as they advance academically. This new collaboration is also a significant component of CSU and Tri-C’s efforts to support Say Yes to Education. The initiative seeks to revitalize communities by providing every public high school graduate access to college or other postsecondary scholarships. Cleveland became the nation’s fourth Say Yes city on Jan. 17. To further opportunities for Say Yes students, CMSD graduates attending Tri-C with an intent to transfer to CSU will be given access to KeyBank Scholars Program support staff and resources at the university to maintain momentum toward graduation. In addition, Tri-C and CSU will work with the Higher Education Compact of Greater Cleveland to introduce more CMSD students to the possibilities offered through postsecondary education, with the goal of enhancing higher education enrollment.